Short and Distort - What Does It Mean? 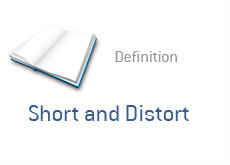 What is the definition or meaning of "short and distort"? A "short and distort" is basically the exact opposite of a "pump and dump". In a "pump and dump", investors will buy up shares of a stock, sing its praises to anyone who will listen (usually exaggerating the future potential of the company), and then dump their shares when people start to buy. In a "short and distort". you have people who first short a stock and then spread false rumors about a company. If the stock drops based on this bogus information, then the short-sellers will cover at a lower price and realize a profit. Example: A trader shorts 2,000 shares of XYZ at $10. He then signs up to every financial message board and chat room imaginable, spreading false rumors that XYZ is the subject of a SEC investigation and is about to restate their earnings for the past two years. This trader is hoping that some of the holders of XYZ will "panic sell" their shares, causing the stock to drop. Then this rogue trader can cover at a lower price and realize a profit. Note: This is obviously extremely illegal. One of the most famous attempts at a "short and distort" came in the summer of 2000. Mark Jakob, a former employee of Internet Wire, sent out a very false press release stating that Emulex was under investigation by the SEC. In addition to that, Jakob's press release stated that the CEO was quitting and the company was restating their earnings from the previous quarter. Jakob had established a sizable short position before distributing the press release. The stock traded as low as the mid $40s from its previous close of $113.06 before quickly recovering. Jakob booked a $250k profit from the scam, but was quickly found out and arrested. Jakob ended up being sentenced to jail for 44 months. He also had to pay back the $250k in fine, as well as an additional $103k in fines. Naked Short Selling: What Is It Exactly?